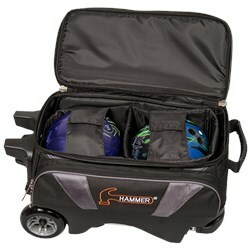 The Hammer Premium 2 Ball Roller bowling bag is made of high quality materials and contains deluxe features. The deluxe features include, but are not limited to, lots of space for accessories, large Smooth KRuze wheels, as well as a Retractable flush locking handle. The padded protector that surrounds the bowling balls and the velcro straps help keep the balls in place and secure. 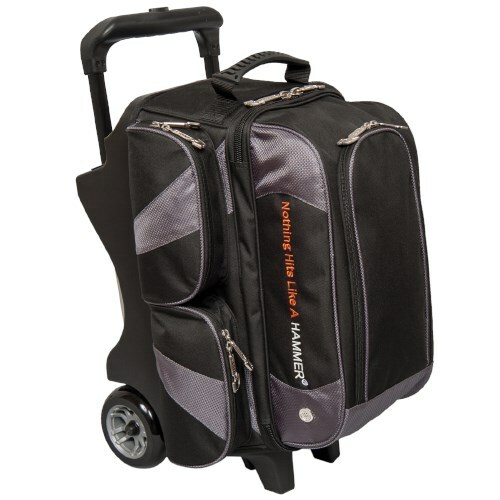 You can't lose with this stylish 2 ball roller bowling bag! I am very impressed with this bag. I use this for the wife and I. The bag has ample room, and I can easily store 2 pairs of shoes. The extra side storage allows me to include a lot of "extras" that I couldn't easily store in my other bag. The extra height afforded by the local able handle makes it extremely easy to pull the bag behind me without getting caught up in my feet (I'm 6-1). 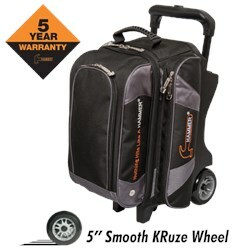 The extra handle grip makes it very easy to lift the bag to store in the trunk of my car. The price caused me some pause, but I have no regrets now. I highly recommend this bag. One other note - When I registered the bag on the manfacturer's website, I had a question, and sent an email. I received an immediate response. Very impressive service! Love this bag. Just a weekend bowler and it's perfect for what I do. It's built tough and made for ease of use. My 5 year old daughter was pulling it around for me, fully loaded, with two 16lb balls. Its great! What are the correct dimensions to this bag? Can't be 32" high. Hello Tom. The dimensions that were given to us were given to us by Hammer directly. Hey. The inside will be padded ball cups with retaining straps. What is the weight of the case? Hello. 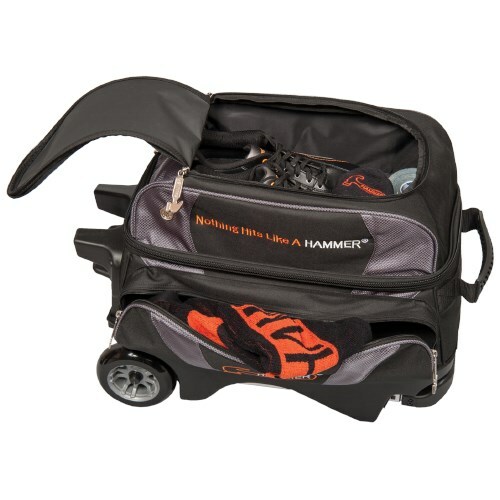 The Hammer Premium 2 Ball Roller will be around 10lbs when empty. does this come in blue and black ? Hello Ian! This bag only comes in black and carbon, and orange and black. The Ad shows 3 different stylesof interiors/ball securement. Does the bag come with all 3 styles? Due to the time it takes to produce the Hammer Premium 2 Ball Roller Black/Carbon ball it will ship in immediately. We cannot ship this ball outside the United States.